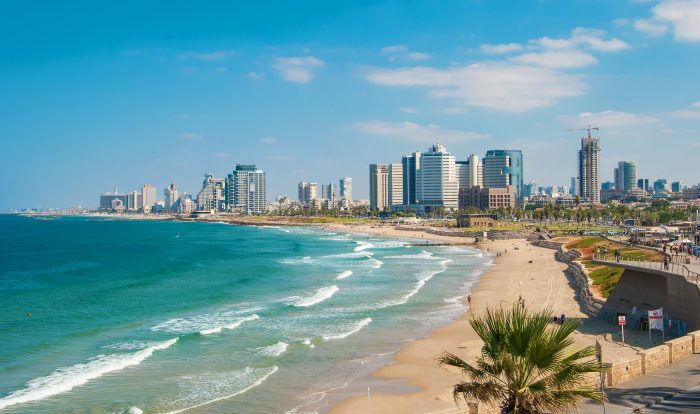 Running along the Mediterranean is the iconic Tel Aviv run. There are wonderful views of the beach and the water, with high rises and hotels on the inland side. A nearly 8 km promenade runs from Tel Aviv Port in the north to the old Port of Jaffa in the south. Highlights, from north to south include: the Marina, at the 1-mile mark, Charles Clore Garden, the St. Archangel Michael Monastery, and Jaffa Port. The beach can also be excellent for running — wide, with good, packed sand. The promenade can get crowded, especially on weekends. Also, this is a great run to do at sunset! NORTH of Tel Aviv Port to Herzliya. One can continue on a bike path north of Tel Aviv Port for about 2.5 km to HaTsuk Beach. From there, the path is interrupted for 1.5 km before it picks up again at Herzliya Marina for another delightful 2+ km further north. See our Herzliya Post for more details. Jaffa: A nice ~1 mile add-on is around Midron Yaffo Park, just south of Jaffa Port. Can continue another 1 km or so to the Peres Peace Center, with path some oft the way. Or, run some of the alleys in Netiv HaMazalot near the Clock Tower, and run up the hill at Andromeda from the Clock Tower and enjoy some of the narrow, interior streets. Add-On: On the north side near Tel Aviv port, you can connect to the wonderful trails of Yakron Park along the Yakron River.